habe ich mein letztes Baby-Geschenk genannt. Little Rose I called my last baby gift. And yes, it is sewn. 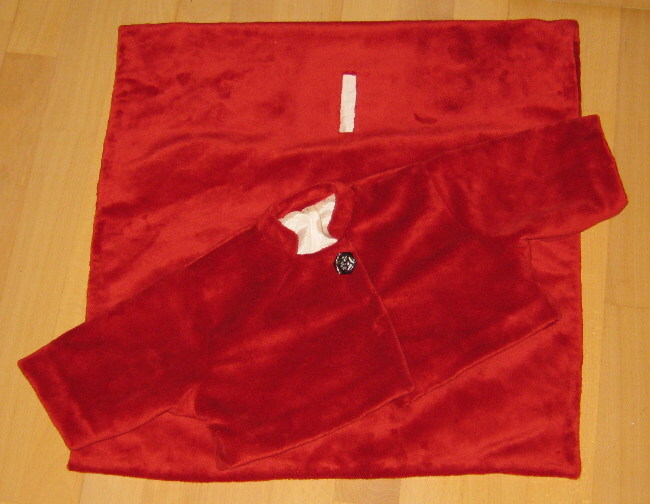 A rest of minky, remnant of a coat of mine made a red baby vest with mandarin collar and a rose button. (Klick on the picture to get a bigger version. )The button has no function, there are sewn snaps that keep the vest closed. Und damit auch die Beine warm bleiben gibt es noch ein Deckchen dazu. Mit Schlitz, so daß der Gurt vom Maxi-Cosi durch paßt. Ich bin gespannt, wie sich das in der Praxis bewährt. The pattern (ca. 3M) is my own and once I’ve managed to scan the pattern pieces (DinA3 scanner would be cool…) I will offer it as download here. Since the vest is short there is a small blanket to go with it. The slit should help to use it in the car seat, where the seat belt has to go somewhere. I’ll ask the mother how well that will work in real life. 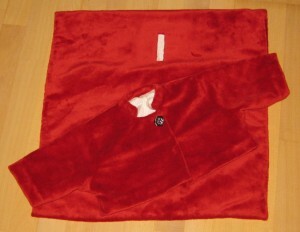 Dieser Eintrag wurde veröffentlicht in Nähen und verschlagwortet mit Baby, Jacke, Little Rose von nowak. Permanenter Link zum Eintrag.